Reports about the colorful European pulling happenings. 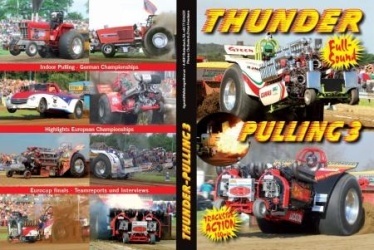 All the highlights from the famous European Super Pull, German Championships, the 2 days European Championship pull in Denmark and the great EuroCup finals are put together on 100 minutes of tremendous, fullsound and earthshacking actionpulling. With reports from the new Dragon Fire, Bandit and more. This is great European pulling with all its different types of engines and combinations used in all the different classes. Like methanol burning V-12`s, turbines or radial engines on minis and modifieds – wonderful. You will watch this film over and over again.